Get your vocals ready because you are in for a scream with the Evil Nun on PC. This horror adventure game takes place in a haunted school. It features some pretty scary graphics. These include floating chalk jolting down blood-curdling words, old rusty décor, dark empty hallways, and spooky looking rooms. However, the scariest thing is the Evil Nun whose appearance is that of a granny, ghost, and zombie all wrapped in one. That is not even the worst part. The nun’s goal is simple- to kill any living soul she encounters. This puts you in a very tight spot. You will be playing as a young boy who is trying to escape from the haunted school. You have to find a way out and avoid crossing paths with the evil nun at the same time. Playing the game is easy. There only two controls to learn. One is a button for moving. The other one is a hand icon that you aim and tap to retrieve items, drop things, open locks & doors, and accomplish a host of other things. In the haunted school, the weirder an item, the higher the chance it is of value in the game. That’s right, to get through the Evil Nun game, you will need to accomplish tasks that will sometimes require odd items. In the beginning, you are required to make an exit through a shutter door. To open the door, you have to press a switch button but there is no electricity. So, you have to first run to another floor, grab a small cable, come back and use the cable to pass current that will restore electricity and thus allow you to open the shutter door and make your way out. Sounds sane enough but things only get more bizarre from there. At some point, you will need to create an explosive doll by placing a doll, crank, & dynamite inside an elevator; use a bottle of oil to restore a rusty elevator; shoot down a super fast rat using a gums gun (consists of a combo of corn, gumball jar,& gun); and so on. There is even a level that involves you placing a white blanket, eagle’s wings, and goat head on a skeleton as a means on diverting the evil nun’s attention! It is a crazy world up in Evil Nun on PC. You will be doing a lot of running, hiding, opening trap doors, and ducking to get away from the sinister nun. However, Evil Nun is more of a thinking game. Winning will depend on how smart you are to out-maneuver the scary nun. The way out is also provided through puzzles. You solve one puzzle, get an item that will advance you further in the game (mastery key, safe key, and locker codes), and then walk into another puzzle. Thinking things through carefully is the key to winning. Evil nun will kill you with no hesitation the minute she finds you. Therefore, to go far in this game, you must avoid her. Staying out of her radar; however, is no easy task. She seems to hear everything. What’s worse, the evil nun is surprisingly stealthy for an old ghost lady. She can sneak up on you without you even noticing her coming. Your only hope is to stay as quiet as possible. Do not go around slamming locker doors, banging drawers, or dropping books. Another way to avoid running into the scary evil nun is to hide. If you see her coming your way, find a hiding spot and hang tight until she either passes you or strolls away in the opposite direction. Some good hiding spots include cars, behind doors, and closets. The haunted school is large with endless hallways and rooms to explore. Because of this, you are bound to get lost a lot as a beginner. Sometimes you will even end up in a sticky situation where you run into a dead end with the evil nun hot on your heels. It is for this reason that a ‘Ghost Mode’ exists in the game. In ghost mode, you will be invisible and therefore out of the nun’s reach. This will give you a chance to study the school’s map, discover hidden getaways, spots where items are, and even perfect your maneuvering moves in the game. This is more of a suggestion than a playing tip really. 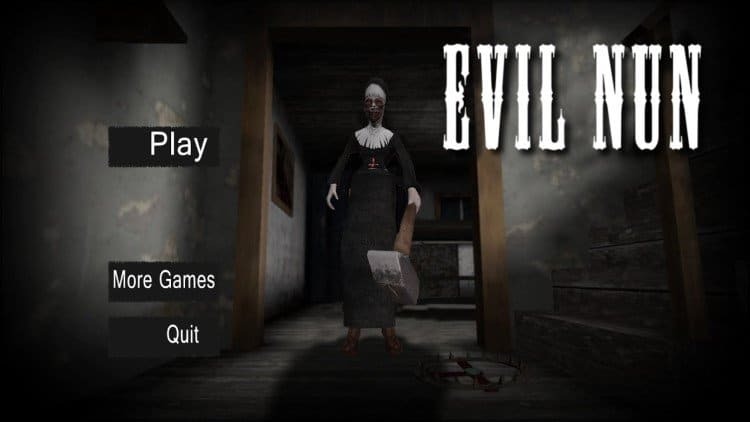 If you want to enjoy the full Evil Nun gaming experience, play with your headphones on. The game’s spooky audio will scare you out of your pants but it will be worth it. Go to the search box in Bluestacks and type “Evil Nun” without the quotes, of course. That is it! You can now enjoy your freshly installed copy of “Evil Nun” on your favorite PC!